More Alaska photos! I posted earlier in the week that I recently traveled to interior Alaska, and while the Northern Lights were amazing and completely unlike anything I’d ever seen before, my favorite part of the trip by far was my visit to Denali National Park. After looking around the Visitor Center and bookstore, my boyfriend and I took a short hike (Taiga Trail) through the woods. We had driven two hours through rain to get to Denali, but it had mostly stopped by the time we arrived. Everything was covered in lovely rain drops. We ate lunch in the parking lot of the Visitor Center and watched in amusement as several ravens and a magpie raided the bed of a pick-up truck, whose owner had apparently not made their food securely corvid-proof. We drove up the park road for a bit to see some of the rest of it. One of the things we didn’t see during the trip is the mountain Denali itself. You wouldn’t think it would be easy to hide something that’s four miles tall, but it refused to come out from behind the clouds while we were there. The highlight of the visit, however, was the park sled dog demonstration that was conducted at the park headquarters kennels. 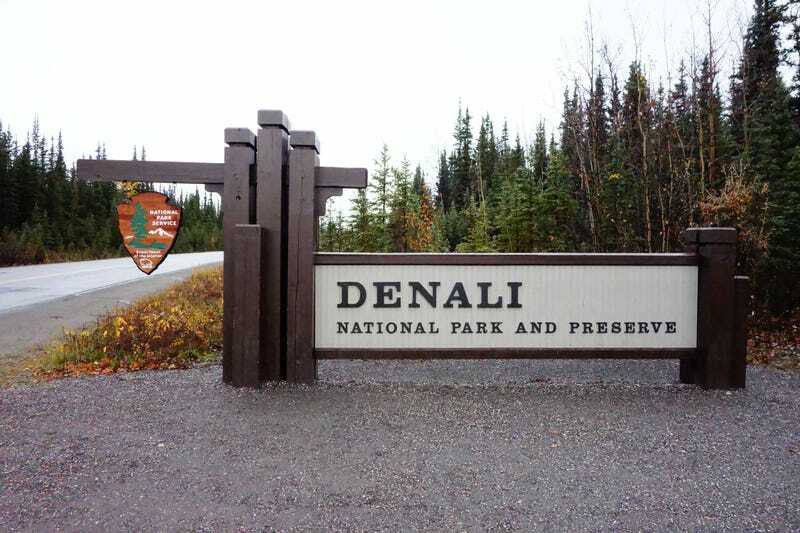 Denali is the only U.S. national park that employs sled dogs as canine park rangers, a tradition that goes back to the park’s origins. All of the dogs you’ll see in these photos are the same breed - the Alaskan Husky. Alaskan Huskies are not bred to a breed appearance standard. Instead, they are selected for behavioral and physical traits that make them uniquely suited for the important work they do. The park has about 30 dogs, but the teams that pull the sleds are made up of 8 or 10 dogs, depending on the weight of the load they are pulling. The dog sled is used in part to minimize the impact that the rangers may have on the wilderness of Denali (powered vehicles are prohibited in some areas), and also because it is still an extremely practical way to travel through remote areas in the winter. Visitors were welcome to interact with the dogs, but these are working dogs and not household pets. Very few of them were the bouncy, excitable types that are all smiles and wagging tails. All of the dogs became extremely vocal and animated when it was time for the sled demonstration, though. This is the sled that was used in the demonstration. The rangers used only a 5-dog team because they were only pulling the weight of the sled and the musher. This graphic is not my photo, but it does illustrate the different positions that the dogs occupy when pulling the sled. All of the positions are important in different ways, and not every dog performs at their best in every position. The kennel master tries all of the dogs in all of the different positions, next to different dogs, so that she can learn their strengths and weaknesses and put together the best team possible with a given set of dogs. It’s a big job. These teams are not racing teams, however. The sled dogs are used to haul man-made objects out of the wilderness area in the winter, and to allow the park rangers to assist scientific research by placing measurement equipment in remote areas. After the demonstration, which consisted of the dogs pulling the sled and musher around a loop, they were sent back to their kennels one by one, where we could really see how fast they were. Speed is not the only important characteristic of the Alaskan Husky - they are uniquely adapted to the cold weather with a thick undercoat, coarse topcoat, and a circulatory system that allows them to maintain a consistent body temperature in their limbs, even in extremely cold weather. The sled dogs sleep outside and curl up into a ball, covering their noses with the tips of their tails and warming their entire bodies. The dogs work until they are about 8 or 9 years old, depending on their health, and are then retired and adopted out to active families who live in cold climates. But every year, a litter of pups gets ready to replace the older dogs as they retire. The pups start behavioral training early, but only pull the rangers on skis (skijoring) after they learn how to wear the harnesses. They aren’t incorporated into the sled teams until they are over one year old, and they still haven’t achieved their full growth by then. After the sled dog demonstration, we explored a bit more of the park, and saw a bull moose off the road. By the time we had stopped the car and gotten out, he’d gone really far. The RX100 doesn’t have a great zoom, but there is a tiny brown blob in the center of the photo, between two trees, that is the moose. There were some rangers supervising the people who had pulled over to take pictures, because it’s rutting season and the moose can be extremely aggressive. WE SAW A WOLF. WE SAW A WILD WOLF IN THE WILD. IT JUST CROSSED THE ROAD IN FRONT OF US AND LIKE AN IDIOT I DID NOT HAVE MY CAMERA READY. BUT WE SAW ONE, AND CONFIRMED IT WITH THE RANGERS WHEN WE DESCRIBED IT TO THEM.